A new shape designed for convenient transport is a distinct feature of the newest addition to the Ace Roto-Mold tank line. 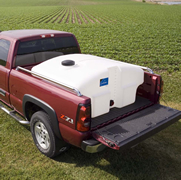 The new 305-gallon Pickup Tank from Den Hartog Industries, Inc. is just 30" in height. This popular low-profile design improves rear vision; drivers can see over the tank when it is placed in the bed of their truck. At 60" wide and 58" long, the tank fits pickup truck beds with a minimum of 59" of length and 61" in width. Wheel Well recesses allow use of your full truck bed space, and placing one end behind wheel wells help keep the tank from sliding out the back of the pickup. 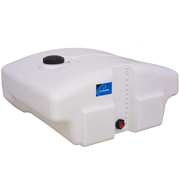 Two hand-holds on each side of the tank make it easy to lift and place the empty tank into a truck bed. Shipping weight of the tank is 97 lbs. This tank was designed to use the wheel wells of a pickup bed for support. If used as a stand alone tank with no support, the customer may see sagging of the sides in very hot weather. This tank is designed for water only use.